When you think about a dog or young puppy, what types of images come up? In most cases, people associate canine companions with playful attitudes, loyalty, and adorable social interactions. These creatures are known for being incredibly smart. They form strong bonds with other dogs and human members of their family. Many times, dogs are capable of forming relationships that are so powerful it's as if they can communicate with their owners despite not being able to talk. They're capable of reading their owner's emotions and responding accordingly. But what if your dog doesn't harbor any of these social traits? It's not that your dog doesn't love you. It may be because he or she has a form of autism. The unique condition is typically associated with humans. However, the common symptoms can be present in dogs as well. It's referred to as canine dysfunctional behavior. For humans, autism is a broad term that covers a range of different disorders. People with the condition all display similar characteristics. It can affect social interactions and affect the way relationships are formed. Communication is also affected. Those with autism are incapable of processing emotions and non-verbal cues. One of the most jarring characteristics of someone suffering from autism is repetitive behavior. It's often used as a coping mechanism. However, it often goes beyond the point of helpfulness. The behaviors can become unstoppable even after they've caused physical damage or pain. All of these same characteristics are found in canine dysfunctional behavior. Veterinarians are hesitant to diagnose dogs with autism. It's very rare that they'll even diagnose a dog with canine dysfunctional behavior. Research in the field is still in its infancy and it's currently impossible to know for sure. What Causes Autism in Dogs? Autism, or canine dysfunctional behavior, is an idiopathic condition. This means that the exact causes are currently unknown. What scientists and veterinarians do know is that its impossible for dogs to "catch" autism. There's no way that they can get it at some point in their life. It is congenital. If your dog suffers from autism, they were born with it and inherited it from a past relative. It is believed that dogs with autism lack crucial mirror neurons in their brain. These neurons are responsible for helping dogs learn the social norms. They're aptly named because dogs can mirror the behavior of other canines and learn how to be social. Without these neurons, your dog can't develop the skills they need to build relationships. Due to the limited information about autism in dogs, it can be difficult to diagnose the condition. Veterinarians can perform a number of tests to show how well your pooch responds in certain situations. However, they're not always concrete. Unlike with human autism, canine dysfunctional behavior doesn't have a spectrum. Instead, we must rely on behavioral cues and compare them to what is considered normal for dogs. These symptoms will make themselves known early on in your dog's life. As mentioned earlier, it's a congenital disorder they inherit. You may notice that your dog is having issues as a puppy, making the training process very difficult. If you suspect that your pooch has autism, look out for these symptoms. Dogs are social animals that love to play with humans, other dogs, and any other creature that comes by. A lack of interaction in these instances should raise a red flag. This is especially true if your dog won't pay any attention to you during normal feeding times or on walks. Dogs with autism often have what some people may call "flat" personalities. They're unable to express their feelings openly. They won't let you know when they're happy, sad, or anything in between. You may even notice that your dog enters a trance-like state where they simply stare at one direction for extended periods of time. Another thing to pay attention to is eye contact. Dogs with the disorder will avoid eye contact with you and other dogs. Repetitive motions are a key characteristic of autism. This behavior can include a wide variety of actions. They may perform harmless acts like walking around the perimeter of a room over and over again. Alternatively, they may grind their teeth or chase their tails continually. You may also notice a strange habit of keeping things incredibly organized. While it may seem beneficial that your pup lines their toys up according to size or softness, it could indicate that they're suffering from autism. One of the most difficult symptoms to deal with is inappropriate reactions to unfamiliar stimuli. It's not uncommon for dogs with autism to yelp or bark at even the slightest touch of your hand. They may also over-react to unexpected sounds. This is because they lack the ability to cope with new experiences. 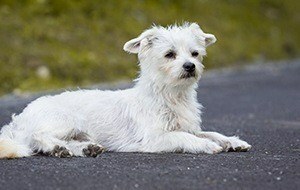 Your dog may also avoid new environments or situations. They'll retreat to a safe space they're comfortable with. Many of the previous symptoms will lead to increased lethargy. Dogs with autism prefer to lounge around all day instead of going outside or playing. They will show a lack of interest in pretty much anything around them. This can be alarming, especially if your dog is a breed that's known for being high-energy. How is Autism in Dogs Treated? The first thing you should do if you suspect that your dog has autism is to take them to the vet. They can perform numerous tests and work with you to create a care plan that may be beneficial for them. While there is no known cure for autism, you can do your part to prevent unwanted behavior and keep your dog comfortable. The key is to create a welcoming environment and avoid possible behavioral triggers. Dogs with autism can react strangely or even aggressively when they're presented with stimulation that they're not comfortable with. The best thing for them to do is go to a spot that they feel safe. You should create this space for them and make sure that they have access whenever they need it. It could be their dog bed, kennel, or specific room. Dogs are creatures of routine regardless of whether they're suffering from autism or not. Your canine companion will learn how things are done relatively quickly. If you stick to this schedule throughout your dog's life, they'll thrive. For dogs with autism, that normal routine is like a security blanket. They'll know what to do, when to do it, and what to expect. If you need to introduce new things to your dog, make sure that you do it gently. New stimuli can be very scary to a dog with autism, so you must do things a bit slower. If you're giving them a new toy, let them have some time to scope it out first. If you're getting new furniture, start small. While it may be a bit frustrating at first, taking things slowly will benefit your dog in the long run. One of the worst things you can do is baby your dog and be overprotective. While it may be tempting to keep your precious pooch safe at all times, this will only reinforce unwanted behavior. By jumping to their aid every time, you're showing them that there really is something to be scared of. You need to be compassionate while also remaining firm. It's a tricky task that will require a lot of trial and error. However, when you do find that sweet spot, it'll get much easier to help your dog flourish. You shouldn't throw your dog into uncomfortable situations just for the sake of doing so. Dogs with autism have unique needs and some parts of their personality simply can't be changed. While you can be firm about introducing your dog to a new home, you can't force your dog to be more affectionate. It's important that you accept that your dog is different and respect their needs. Your dog may not like getting touched. While this can be heartbreaking, you need to respect their wishes and not force anything unless you absolutely have to. When you're speaking to your dog, it's good to keep things very simple. Use one-word commands and hand motions that are easy to understand. Talking to them with a long string of commands will only overwhelm them. Not only will they not do what you say, but they may also run off and hide. Diet and exercise are vital components of good mental and physical health. When humans are diagnosed with autism, a change in diet is often recommended. While there's no current evidence to show that doing the same for a dog may help, it doesn't hurt. Consult with your vet to see what they recommend. A high-quality diet may help to alleviate symptoms and improve behavior. Exercise can help to reduce anxiety. Your dog will be able to get rid of all that nervous energy and put it to something useful. Beyond the physical benefits, exercise can also be used as part of their daily routine. Sticking with a comfortable regime will make them feel more secure and happy. Fluoxetine is a medicine that's used to treat autism and OCD in both humans and dogs. It's not meant to cure the disorder, but it may help to alleviate some symptoms. It can make your dog calmer so that they display unwanted behavior less often. The medication is ongoing but may do wonders for your dog's overall health. It may help them live a more normal life. Speak with your vet to see if its something that's safe for your dog to take or if it may provide efficient results for your dog's unique issues. Are Any Breeds More Likely to Experience Autism? While there is limited information about this issue, a study in 2011 showed a possible link between autism and Bull Terriers. The breed is notorious for odd behavioral patterns. 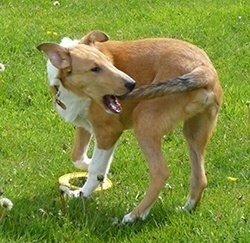 Many dogs of this breed display OCD behaviors like chasing their tail. While this may seem innocent enough, many dogs are so dedicated to the act that they cause physical damage to their tail. The study found that the dogs that do this share many of the same characteristics as humans with autism. Then, in 2014, another study showed that humans with autism and Bull Terriers have higher levels of hormones that release neurotensin and corticotrophin. These studies have helped to provide more information about autism as a whole. The data gathered allowed researchers to develop a new OCD drug that's used for humans and animals. Dogs are complex creatures that are capable of suffering from autism just like humans. If your dog is displaying symptoms, it's a good idea to take them to a vet for further analysis. Owning an autistic dog can be tough, especially if they don't display the same levels of affection that you do. However, it's important that you stay strong and be there for your dog. With a few small changes, you can make your home a safe space where your dog can thrive. Also Read: Why Do Dogs Chew their Nails?